It’s fitting that Sidney Crosby will share time with Matt Cooke, the NHL’s most reformed player this season, in his Thursday return to hockey. Cooke, having been suspended for 21 games last season and feeling organizational pressure to change his ways, came into this season with more than a few questions to answer. Answer them he has, fundamentally altering the way he plays the game in order to survive, and, thrive—Cooke has more points than penalty minutes this season, a career-first. If Crosby’s going to outrun a third bout of concussion symptoms, he may need to alter his style of play as well. Crosby’s first return was marked by a stubborn willingness to play the game as he always had—hard along the boards, tenacious on the cycle, relentlessly spinning off defenders below the goal line in order to get to the front of the net. Crosby turned himself into one of the game’s preeminent goal-scorers by planting himself down low and creating offense from behind the goal line. It’s a productive place to play, but one of the most dangerous. No area of the NHL sheet invites as much contact as the low boards. It was a hit from Tampa Bay’s Victor Hedman along the low-boards that put Crosby out for good last January, and an errant elbow from David Krejci in another battle along the high-boards was the most likely culprit for the second onset of symptoms. In limiting Crosby’s time with third-line duties, placing him on the point of the power play and pairing him with two of the club’s more ferocious forecheckers, the Pens are forcing Sid’s hand, at least early, in the direction of change. It’s not the first time Crosby has adjusted his game. Crosby entered the league as a gifted playmaker, but wasn’t always excellent in the faceoff circle. He picked a summer to work specifically on his faceoffs, and the returns were immediate. Sid has since then been one of the league’s best on the dot. 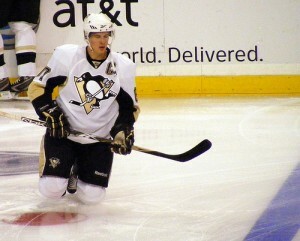 In the 2009 postseason, Crosby set a goal-scoring pace that was a far cry from his usual tendencies to dish and assist. Before 2009, he never finished a season with 40 goals. He followed up with a 51-goal regular season in 2009-10. Last year, he was on pace for 64 markers before being hurt. In the past, Sid has adapted his game to address areas of need, and often with smashing success. But those improvements were just gravy on top of an already solid game. Crosby didn’t have to score at a Rocket Richard pace to contribute offensively. The team already had its defensive center in the board-to-board wingspan of Jordan Staal. The concussion saga is going to force a change. Crosby needs to buy into that sense of change with the all-in attitude that Cooke took in remaking his physical game this year, growing pains notwithstanding. Is anyone going to be upset with Crosby for spending a little more time floating high above the circles while Cooke and Kennedy get their noses dirty down low? Or for seeing a drop from his better-than-1.5 PPG pace while he adjusts to life with a little less contact? Leaving Crosby up high on the power play is an indication that the coaches are A) happy with their down-low scorers of Malkin, Neal and Kunitz and B) they believe Crosby can be effective even when removed from his preferred scoring areas. The Penguins have two scoring lines to fill the net and unlimited grinders to play the low-boards, crash-bang cycle game. What they haven’t had, in any abundance, is their captain. If limiting his minutes and sheltering him in the open areas of the ice are the first steps in making this comeback a lasting one, they’re the right ones. After all, if anyone can make the considerable shift of being taken out of their net-front kitchen and adapt to life above the circles, it’s Crosby.